The European Bluegrass Blog: Bonne Année y'all - Happy New Year from BRT! Bonne Année y'all - Happy New Year from BRT! L'année 2006 nous a rendu très heureux. Et pour 2007, tout le groupe vous souhaite une Nouvelle Année plein de Bonheur et de Musique! It was a great 2006. And for 2007, the whole band sends you their Best Wishes for a Happy - and musical - New Year! 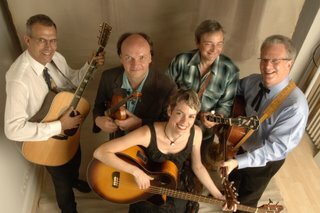 BRT are on the cover of Bluegrass Europe #53, with a three-page article on the band by Oliver Brown inside. Happy 2007 to all bluegrass friends!